This IBM® Redbooks® publication provides system administrators and developers with the knowledge to configure an IBM WebSphere® Application Server Version 8.5 runtime environment, to package and deploy applications, and to perform ongoing management of the WebSphere environment. As one in a series of IBM Redbooks publications and IBM Redpapers™ publications for V8.5, the entire series is designed to give you in-depth information about key WebSphere Application Server features. WebSphere Application Server V8.5 provides two runtime profiles. Every WebSphere Application Server package includes both profile types. The runtime traditionally available with the WebSphere Application Server packages is referred to as the full profile. The application serving run time provided with this profile is composed of a wide spectrum of runtime components that are available when the server is started. The full profile provides support for Java Platform Enterprise Edition 6 (Java EE 6) and Enterprise OSGi technologies. The Liberty profile provides a simplified stand-alone run time for web applications, supporting a subset of the programming model available with the full profile. Any application that runs on the Liberty profile will also run on the full profile. 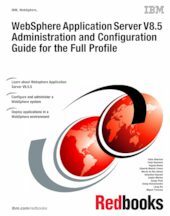 In this book, we provide a detailed exploration of the WebSphere Application Server V8.5 runtime administration process for the full profile. This book includes configuration and administration information for WebSphere Application Server V8.5 and WebSphere Application Server Network Deployment V8.5 on distributed platforms and WebSphere Application Server for IBM z/OS® V8.5. This book has been updated with information about the new features in WebSphere Application Server V8.5.5. The Liberty profile administration and configuration information has been moved into a separate book.